Flaggskipet til Eizo. 31,1" 4K skjerm med innebygget kalibrator. and 3D CGI, VFX, compositing, and color grading. standards and 99% of Adobe RGB. What's more, it reproduces the sky blues and lush greens that standard sRGB monitors cannot. top bezel and swings down onto the screen only when calibrating. multiple options for monitor profiling and print matching. a button on the front of the monitor. and at 30 Hz by both HDMI inputs. temperature may have on color temperature and brightness to ensure stable image display. that supports Deep Color is necessary with the HDMI inputs. characteristics to stabilize. 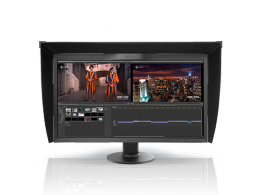 EIZO has shortened the warm-up time to a mere three minutes. color display soon after turning the monitor on. and ensure smooth tonal display. settings and saves hundreds or even thousands of hours in annual maintenance time. ColorNavigator Network pages or watch this animation. that subtitles and other text will be visible. and left and right sides is bundled with the monitor. products at its own factories ensuring close control over production quality. temperature between 5000 – 6500 K.